Sushil’s life began in the foothills of the Himalayas. With two older and one younger brother and one sister, parented by a single mother due to the early death of his father, Sushil’s family lived in a large house in Gola Bazar, with several of the rooms rented out. During the mid 80s, the Royal Government of Bhutan introduced a unification measure, described as a ‘one nation, one people’ policy. “Socially, culturally, religiously, ethnically, everything in every aspect of life, they wanted the people of Bhutan to look [as] one,” Sushil said. The Royal family’s origins stemmed from Tibet. 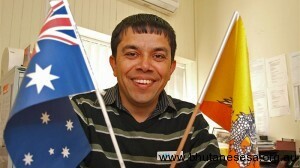 Sushil’s ancestors had settled in Bhutan, from Nepal, in the 1600s. “The ruling class wanted to impose their ideas, their laws, their culture,” he explained. Soon after the protests began Sushil’s brother began to attend the meetings. A spate of similar occurrences followed that Sushil considered ‘ethnic cleansing’. He and his mother began to receive nightly visits from the government’s police and army, encouraging them to follow his brother and leave Bhutan.